First fill ex-bourbon for 21 years? Amazing! Anytime I see first fill ex-bourbon on something I get excited. Fresh casks right? Also air drying sounds quite appealing as well. It reminds me of photos I’ve seen of wood planks being air dried in Spain to prepare them for cask making. The move to bottle at 35cl seems down right logical to me. I suspect some people might be complaining about this but demand is super high these days (over 680,000 FoL right now) and in order for more people to get a chance to try these babies bottling volume has to go down. I am all for it. As for the price, it’s a bit pricey but if you break it down it makes sense. £99 for 35cl equates to £198 for 70cl. Given that these are all first fill casks with some being air dried, production costs will be higher. I mean it’s still high I suppose but people will buy it up as fast as if it were £20. So that’s business. I guess. As for sales by ballot, another smart move. Seems like Laphroaig is learning from past issues of servers crashes. By using a ballot system they can trickle in activity on the site to reduce server overload and they also have a somewhat fair system of distributing the product to interested customers. However, I know that quite a few people did not get selected during the Cairdeas 2015 ballot (TheMadVatter included) which probably lead to some disappointed FoL (TheMadVatter included). But hey that’s life I guess. Judging from my polling during the Cairdeas run, it seemed like 2 out of 5 people were selected. Not sure what it will be like this time. Maybe the higher price and lower bottling volume will mean more people actually getting to buy this stuff this time. We’ll see. “The Friends of Laphroaig have now ‘come of age’ – we are 21 years old this weekend! 1994 was a landmark year for us in many regards. HRH Prince Charles paid his first visit to the distillery (awarding Laphroaig the Royal Warrant shortly afterwards – the only single malt scotch whisky to hold this honour), and it was the year our “Friends of Laphroaig” community was formed. It all started as a way to thank all of our friends for their support, so we decided to give each ‘Friend’ a square foot plot of land at the distillery – and that we would pay them ‘rent’ of a dram of 10 year old each time they came to visit us. No one then could have guessed that, 21 years later, over 680,000 plots would have been occupied! Over the years we have had everything from proposals and marriages to sculptures placed on your beloved plots, and visitors from over 100 countries around the world. You may have noticed in the news recently that Plot Holder No.1 (HRH Prince of Wales) came to visit us again in June and officially opened the stone Cairn that has been erected amongst your plots to celebrate the journey we have all taken together over the past 21 years. The Friends of Laphroaig exclusive 21 Year Old limited edition. To celebrate our 21 years of friendship, we are releasing a limited edition 21YO exclusively for you. First fill ex bourbon barrels – but some with a difference. A portion of these barrels have had their staves fully air dried which gives extra spicy notes to the whisky. It has been bottled at 48.5% ABV in 35cl bottles and non-chill filtered. I am proud to say that, as with Cairdeas, the distillery will contribute £1 for every bottle sold to The Laphroaig Legacy Fund, which has been established to support sustainable living for the islanders. This 21 Year old will be sold by Ballot. Due to the demand for this exclusive bottling, we will again be fair to everyone and sell it by ballot. From those of you who decide to participate, we will draw names at random to select who will have the opportunity to buy. Up to 3 bottles for each winner. It appears to have had a very bad reception. FOL are finding it it very expensive. A ploy to make money. This is still on sale 2 months after the ballod. Hi Luke, there seems to be a lot of complaints about the details of the release of the 21 for the reasons you have outlined. However, I think the situation is more nuanced than people give it credit for. I’ll try to address some of the points you brought up. 13,000 was just something thrown about on the rumour mill. Not confirmed by any means which I stated in the post. Other reports are saying 6,500. Either way let’s say it is 13,000. That would be 6,500 full bottles if they decided to bottle at 70cl. The Bowmore Devil’s Cask had about that number and it practically vanished before hitting the market. So if Laphroaig had done full bottles it is very likely that many people would not have been able to purchase any. Yeah it’s definitely a stretch. £99 for 35cl means £198 for 70cl, which breaks down to more than £7 per 25ml dram. It’s definitely not a bargain. But if they priced it too low, a lot more would be picked up just for resale on the auctions which is exactly what happened with the Bowmore Devil’s Cask and the Lagavulin 2015 Feis Ile release. So you could pay £99 for a bottle from the retailer this way or if they had made it cheaper then it is more likely you wouldn’t have been able to get a bottle from Laphroaig and instead would have to buy it at auction for 3 times the price if you were desperate to have it. You can see this trend in a lot of recent special release bottlings. It’s a balance here. The fact that you can still get it online through Laphroaig right now supports this idea. And yes of course it’s a ploy to make money. That’s what a business does. They can lower the price and sell out instantly and have the auctioneers profit or they can raise the price and slow down sales and profit more. When it comes to pricing, people will either complain that it is too expensive or that they couldn’t get a bottle because it sold out too quickly. It’s just a question of which scenario is preferential. Would you prefer to not be able to buy a bottle and be happy about the pricing or have the option to buy a bottle but decide not to because you think it is too expensive? Truth is there are a lot of people who won’t accept this compromise and will complain either way, which is what happened when the Caideas 2015 ballot resulted in people only being able to buy 1 bottle each and not everyone on the ballot getting a chance to purchase. Or what happened during the sale of the Ardbeg Perpetuum Distillery Release when it sold out on the day and the site crashed and a slew of complaints came raining down on them from dissatisfied punters. I mean it’s tough to please these days. Also just want to make a correction on something you said, “This is still on sale 2 months after the ballod”. Actually it’s been less than a month since the ballot for the Laphroaig 21 FoL. Sign ups for the ballot began on July 28th and it is currently August 19th. It may still be available in a month and a half but we won’t know until then. While the reception of the 21 may be marred by complaints, I think it is unwise to confuse this with the actual quality of the product. 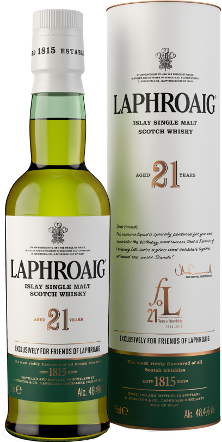 If you look at the rating on the Laphroaig site, the 21 looks horrible but that’s just because a lot of people are giving it one star to complain about the pricing and the size of the bottle. However, you barely see any actual reviews of the whisky. It’s no secret that whisky is getting more expensive. I don’t like it, you don’t like it, but it’s a reality of supply and demand. Shouting at Laphroaig for making smart business decisions is like praising Diageo for closing so many distilleries and then building new ones. A distillery needs to make money to stay afloat. Imagine how much more expensive Laphroaig would be if it were closed today. Thank you for the swift and informative response. I agree with all your points. The FOL just think it should have been a bit more personal. Thanking them for their continued support. Like you say it’s a business and in the game to make money. I myself have bought one and will save it for a special occasion.